The findings, published in The Journal of Chemical Physics, brought together researchers from the University of Illinois and the University of Washington, Seattle in a collaborative project through the Beckman Institute for Advanced Science and Technology at the U. of I.
Nanostructures like microchip semiconductors, carbon nanotubes and large protein molecules contain defects that form during synthesis that cause them to differ in composition from one another. However, these defects are not always a bad thing, said Martin Gruebele, the lead author and an Illinois chemistry professor and chair. The study focused on a class of nanoparticles called quantum dots. These dots are tiny, near-spherical semiconductors used in technology like solar panels, live cell imaging and molecular electronics – the basis for quantum computing. The team observed the quantum dots using a single-molecule absorption scanning tunneling microscope fitted with a needle sharpened to a thickness of only one atom at its tip. The needle nudges the individual particles around on a surface and scans them to get a view of the quantum dot from different orientations to produce a 3-D image. 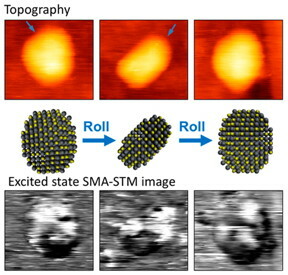 The researchers said there are two distinct advantages of the new SMA-STM method when compared with the current technology – the Nobel Prize-winning technique called cryogenic electron tomography. The researchers looked at semiconductor quantum dots for this study, but SMA-STM can also be used to explore other nanostructures such as carbon nanotubes, metal nanoparticles or synthetic macromolecules. The group believes the technique can be refined for use with soft materials like protein molecules, Gruebele said. The researchers are working to advance SMA-STM into a single-particle tomography technique, meaning that they will need to prove that method is noninvasive. The National Science Foundation, the Eiszner Family Foundation and the Beckman Institute supported this research.